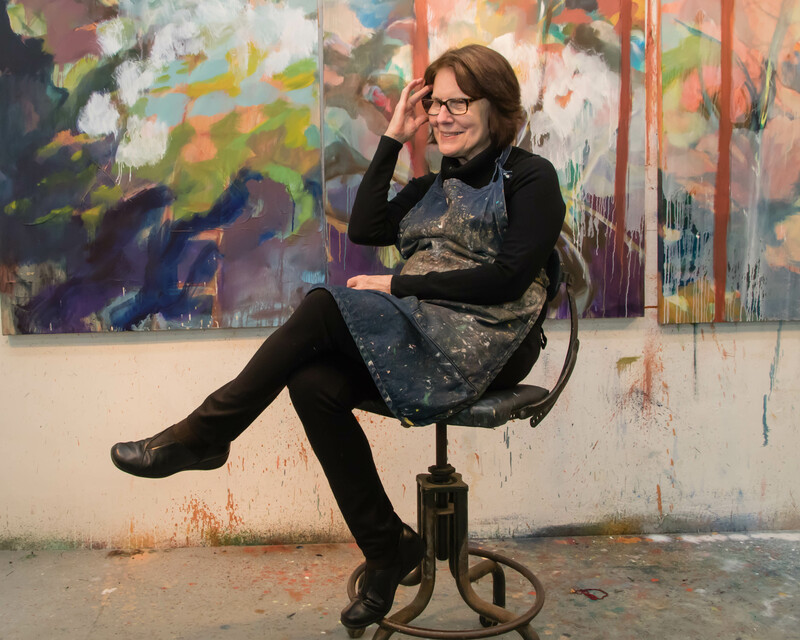 Katherine Kadish is one of the Dayton area’s best known artists. She’s had solo shows from New York to London, Seoul, and Nanjing. 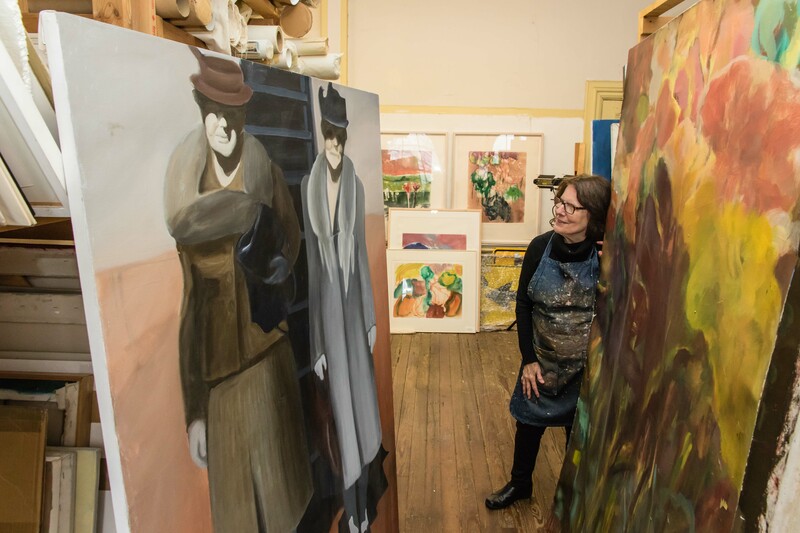 She’s been in group shows in many great museums, including the Philadelphia Art Museum, The Whitney in New York, and National Museum of American Art in Washington, D.C. When I contacted Katherine about a photo shoot in her studio, she asked me to pick her up at her home and drive her to her studio in Clifton. Katherine does not drive. She has had macular degeneration for years and is now legally blind. She hired an assistant a few years ago to help her with her work, but the assistant was not working the day I visited. Katherine suggested we stop at a restaurant near her studio. The place she chose told me something about her. 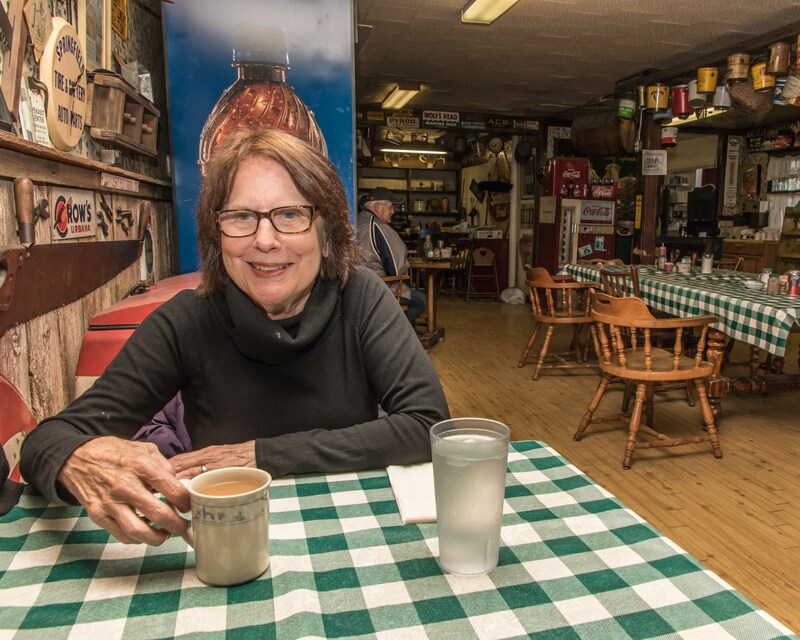 Although her work has been shown in some exalted places, this woman is down to earth. 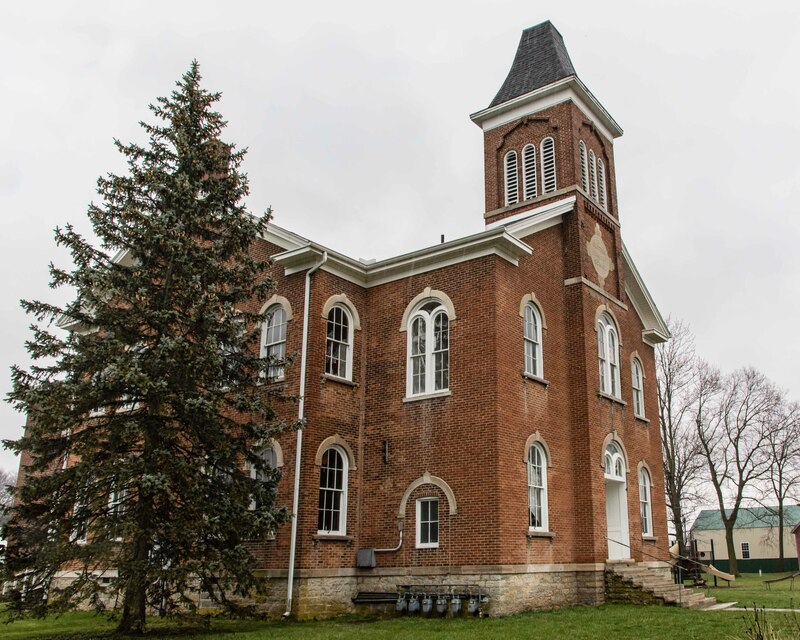 Katherine’s studio is in a converted school built in 1873. There are no other artists in the building, but there are some interesting occupants. One converted classroom holds The Shoebox Theater, which performs original plays in a theater that holds an audience of only 50. 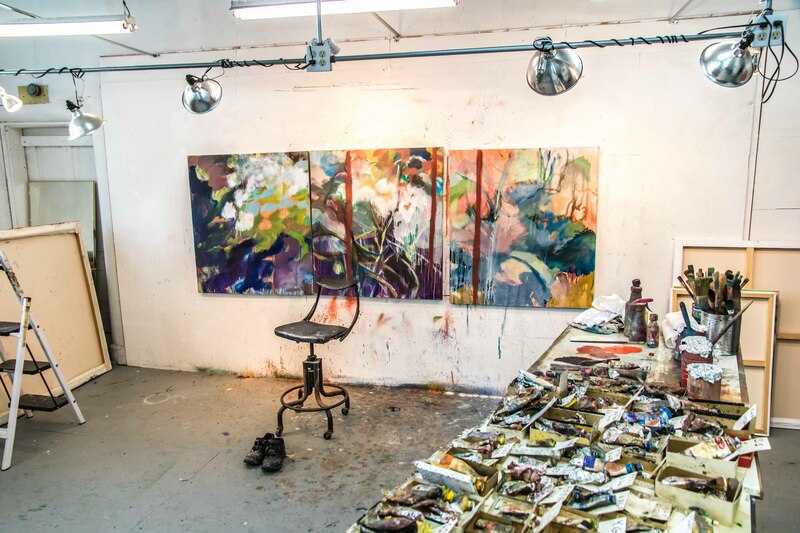 Katherine’s studio is large and is filled with natural light. She also has an array of lights directed at her work. 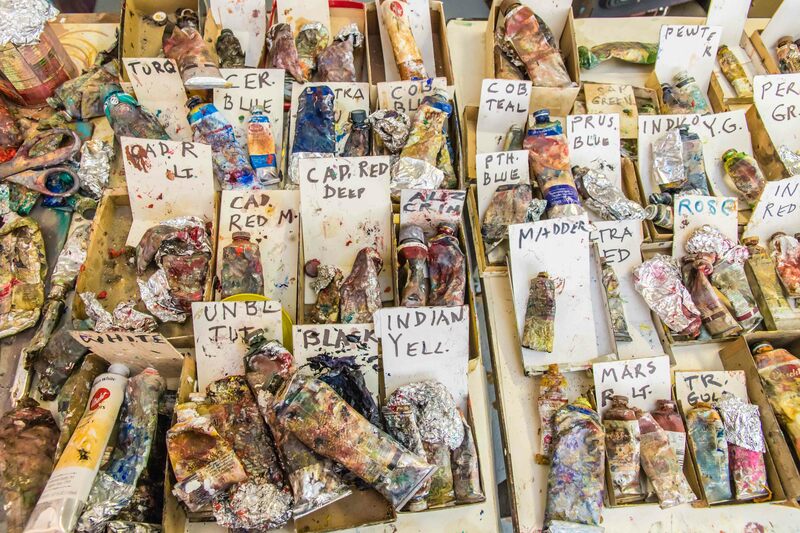 As another aid to her vision, Katherine has written large labels for her paints. Otherwise she would need to scrape paint off of the containers and then struggle to read the name. 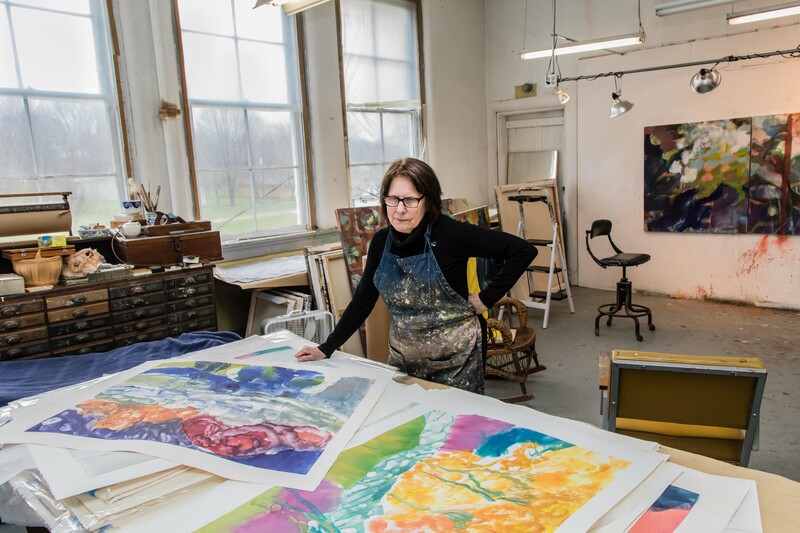 Katherine does her painting in this Clifton studio, but she makes her monotype prints in New York, where she and her husband maintain an apartment. The prints are made in collaboration with master printer Lisa Mackie. 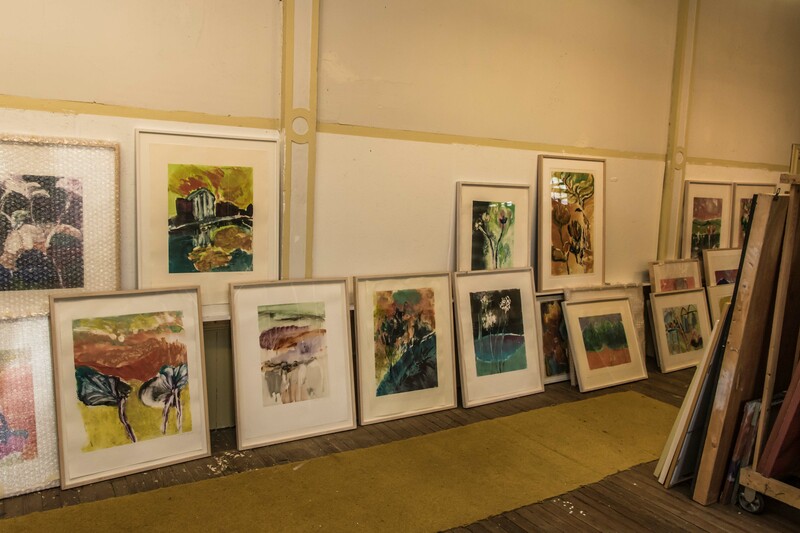 Katherine’s primary task the day I visited was to review her most recent monotypes, She needed to choose 12 for a show in New York and also select some to be sent to a dealer in Charleston, West Virginia. 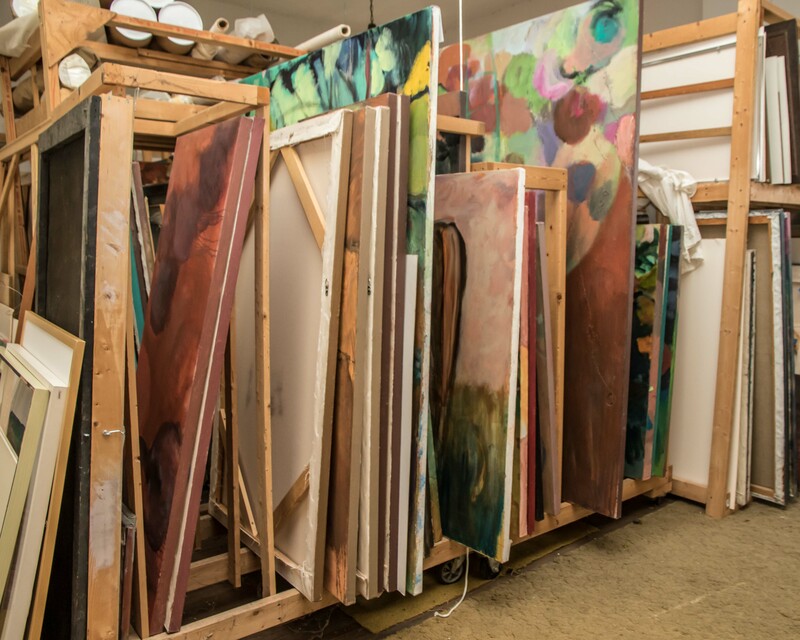 Across the hall from her working studio, Katherine rents a much larger space to store her work. This is also an excellent space for showing work to collectors. Katherine was nice enough to unwrap one of her earlier pieces – a painting made from an old family photo. After she painted this work Katherine did some figurative paintings of swimmers. 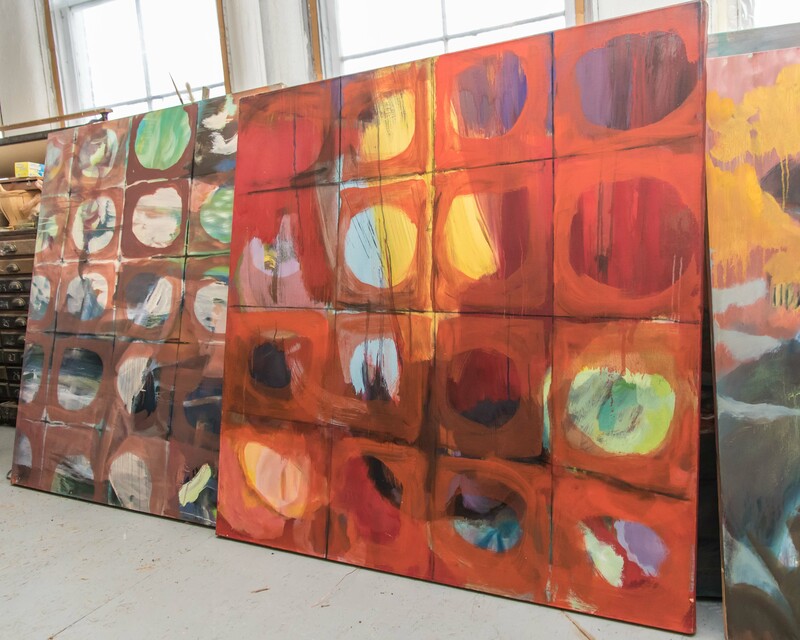 This led her to create abstract paintings that were more about the feel of swimming. She has primarily done abstract work ever since. 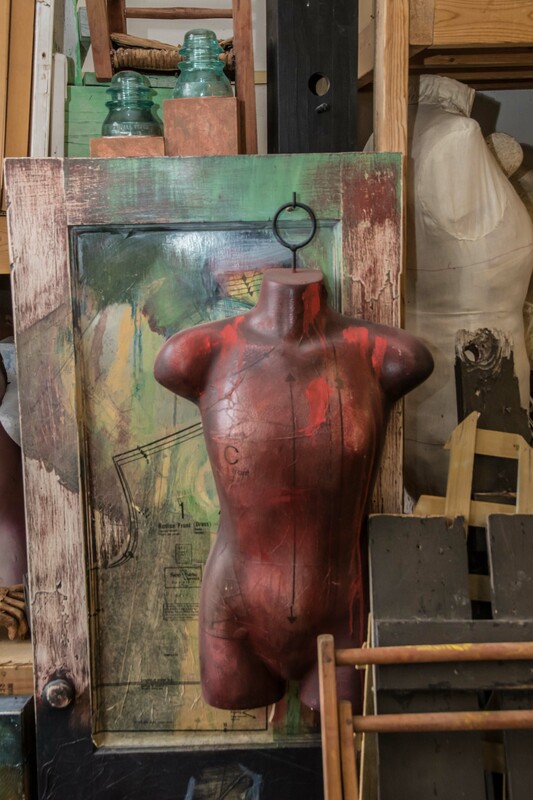 I asked about the mannequins scattered around this storage room. 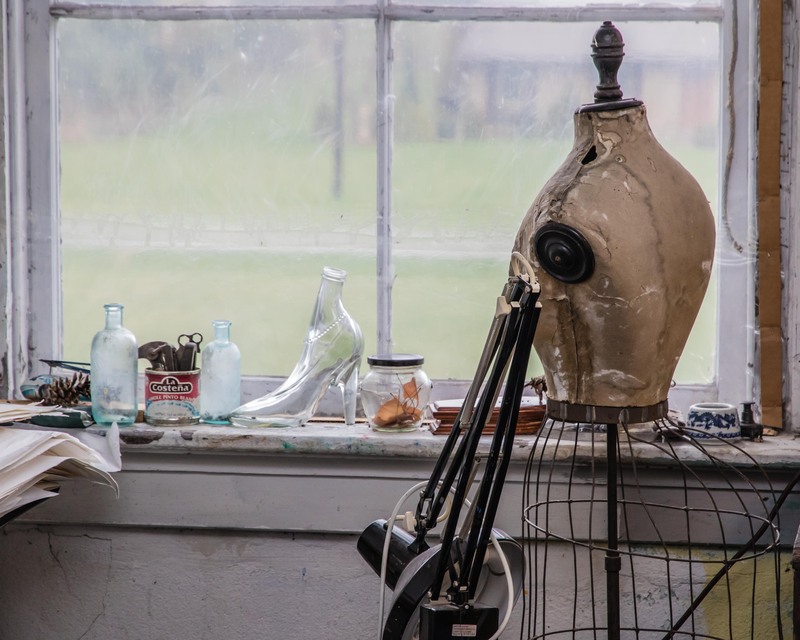 Katherine said they came out of a member show at the Dayton Visual Art Center (DVAC) with the theme “self portrait.” She added to the piece made for the DVAC show and created a group of art works that travelled to several galleries. Returning to the painting studio, Katherine showed me two unfinished pieces that will be part of a Retina series. They are loosely based on photos of her retina that doctors have been taking for decades. 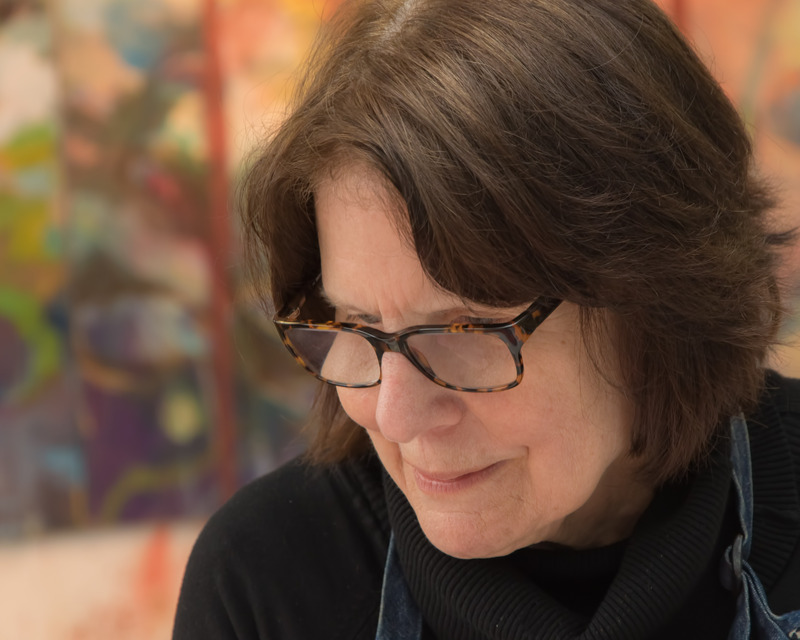 As I packed up my camera and headed for home, Katherine returned to the day’s task – reviewing her most recent monotype prints.